Want to reduce water damage and corrosion of your steel panels? Our foot plates can protect your RHS posts against rust and reduce the chance your posts will sink into the ground. Are your RHS's sinking in the ground and rusting? Our foot plates are a great way to cap off the bottom of your panel RHS's and to ensure the longevity of your yard panels. Each foot plate is zinc plated and made from quality steel to ensure strength and fight against corrosion. With holes on the side, it allows you to pin your panels to the ground for extra stability and reduce noise. This extra width also helps your post sit on top of the ground rather than sink in. 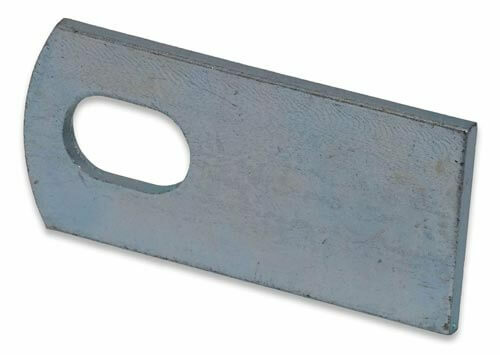 Available in 40mm and 50mm widths, it is suitable for most standard panel RHS posts. Installing a foot plate is incredibly simple. When making your panels, position your RHS over the large flat section (without the hole). The hole should be sticking out in line with the panel, not at a right angle. This means you can pin in down between the panels rather than it stick out into the yard.